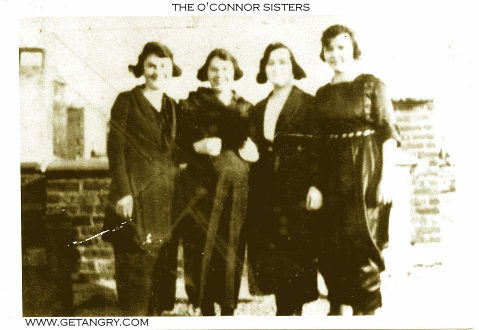 In 1922 the infamous O'Connor sisters; Carla, Candy, Kitty May and Cassandra were found guilty of killing and eating seven portly local children from Killville and surrounding towns. They were sent to the electric chair in the winter of 1925. Their request for "A plump little urchin, medium rare" for their last meal was denied. Many locals claimed they were witches, a charge the O'Connor sisters did not dispute. Moments before the switch was flipped sending Kitty May to her eternal damnation she was reported to have cackled, "I'll be back, and I'll be hungry." In the decades since, there have been numerous unsolved cases of missing overweight children in the area forests. Some superstitious folks say it's the O'Connor sisters, back from the dead. Saner heads say it's most likely coyotes or wild cats. Witches or wild cats, local parents have learned that if you've got a slow fat kid it's probably a good idea to keep him out of these woods. fatty fatty time to die."